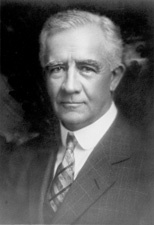 HITCHCOCK, Gilbert Monell, (son of Phineas Warren Hitchcock), a Representative and a Senator from Nebraska; born in Omaha, Nebr., September 18, 1859; attended the public schools of Omaha and the gymnasium at Baden-Baden, Germany; graduated from the law department of the University of Michigan at Ann Arbor in 1881; admitted to the bar and commenced practice in Omaha, Nebr., in 1882; continued the practice of law until 1885, when he established and edited the Omaha Evening World; purchased the Nebraska Morning Herald in 1889 and consolidated the two into the Morning and Evening World Herald; unsuccessful Democratic candidate for election in 1898 to the Fifty-sixth Congress; elected as a Democrat to the Fifty-eighth Congress (March 4, 1903-March 3, 1905); unsuccessful candidate for reelection in 1904 to the Fifty-ninth Congress; elected as a Democrat to the Sixtieth and Sixty-first Congresses (March 4, 1907-March 3, 1911); did not seek renomination in 1910, having become a candidate for the United States Senate; elected as a Democrat to the United States Senate January 18, 1911; reelected in 1916 and served from March 4, 1911, to March 3, 1923; unsuccessful candidate for reelection in 1922 and for election in 1930; chairman, Committee on the Philippines (Sixty-third through Sixty-fifth Congresses), Committee on Foreign Relations (Sixty-fifth Congress), Committee on Forest Reservations and Game Protection (Sixty-sixth Congress); resumed newspaper work in Omaha, Nebr. ; retired from active business in 1933 and moved to Washington, D.C., where he died on February 3, 1934; interment in Forest Lawn Cemetery, Omaha, Nebr. Ryley, Thomas W. Gilbert Hitchcock of Nebraska  Wilsons Floor Leader in the Fight for the Versailles Treaty. New York: The Edward Mellen Press, 1998; Patterson, Robert. Gilbert M. Hitchcock: A Story of Two Careers. Ph.D. dissertation, University of Colorado, 1940; Wimer, Kurt. Senator Hitchcock and the League of Nations." Nebraska History 44 (September 1963): 189-204.